England look to have an easier path to the finals than most, but easy games have been their downfall in the past. 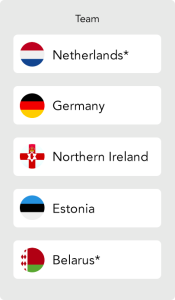 There are five groups containing five countries, with another five containing six. Over ten matchdays, each nation will compete against the sides in their group, both home and away, with the teams in Groups A to E playing eight matches, and those in Groups F to J playing 10. At the end of the qualifying group games, the teams that occupy the top two spots in each group will automatically qualify for the final tournament, determining the first 20 places. The final four places at the Euros will then be contested by the 16 group winners of the UEFA Nations League in the European Qualifiers Play-Offs in March 2020. If a group winner has already qualified for the European Championships, their spot in the playoffs will go to the next best-ranked team in the Nations League groups. If a league doesn’t have four teams to compete in the playoffs, the next highest ranked team from the next league will slot in. Once groups have been determined, they’ll all have a play-off route to the final, featuring two single-leg semi-finals, and a single-leg final. The winner of each path will then book their ticket to UEFA Euro 2020. Despite the qualifying stages not yet kicking off, England are currently fifth-favourites for the overall tournament win, so we think that leaves them as favourites to win this group. Czech Republic are the most likely side to challenge England for the group win, but they don’t possess the same squad strength and depth as the favourites. Bulgaria could threaten for second spot if the Czech side aren’t up for it, but the top two have qualification in their hands. The two fixtures featuring England and the Czech Republic should decide the group winner. If games against Bulgaria, Montenegro and Kosovo can be won, then the top two could be settled early on. Coach Gareth Southgate inherited an old side and injected youth and exuberance into it, leading them to a fourth-place finish in the 2018 World Cup. Harry Kane is the captain and England’s star man after winning the Golden Boot in Russia. Raheem Sterling is having a sensational season so far, and if he carries his form into the England set-up, they’ll rake in the rewards. Jadon Sancho’s development has reached new heights at Borussia Dortmund, making him one of the key men to look out for. The Portuguese won the European Championships in 2016, and they’ll be hoping they’ve got enough quality to compete again. Captain Cristiano Ronaldo is still the star man hoping to lead his country to another championship, with the holder’s squad filled with quality in attack. Serbia could challenge for top spot in the group, with Dusan Tadic and Aleksandar Mitrovic having great seasons for their respective clubs. Fixtures between Portugal, Ukraine and Serbia will be crucial to decide who clinches qualification via the group stages. All three have already impressed in the Nations League, so all have a playoff spot to fall back on if needed. After a woeful World Cup, the Germans have regrouped and refreshed their squad, getting rid of the old and bringing in the new. The Netherlands are most likely to compete with the Germans. They’ve made it to the Nations League Finals so come into the qualifiers in good form. There’s some of the best young attacking talent around in this group. Timo Werner, Leroy Sane and Serge Gnabry form part of the new guard for Germany. Virgil van Dijk and Matthijs de Ligt have gained all the plaudits this season in one of the most highly rated defensive partnerships in world football. Northern Ireland are likely to be the best of the rest in this group, waiting for the two front runners to slip up. Who have Northern Ireland got? In one of the unlikely success stories of Euro 2016, Will Grigg became one of the most loved footballers at the tournament. He’s back in the squad and could fire them to glory should he find his best form. They will need to firstly focus on beating Estonia and Belarus before coming up with a solid game plan to make life as difficult as they can for the two favourites. 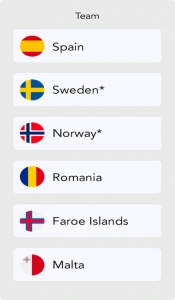 If they’re able to take points from Germany or the Netherlands, they’ll leave themselves in a good spot. They may be focused on the playoffs already, but depending on how other squads perform, they need to put themselves in the best spot to capitalise on failures. Switzerland and Denmark look set to battle it out for top spot in this group, with both sides having a few key men that will be crucial to their qualifying campaign. They’re likely to occupy the two top spots in Group D, with Christian Eriksen crucial to the Danes. Xherdan Shaqiri has been the star man for the Swiss for years. On his day he can single-handedly win a game with a bit of brilliance. Republic of Ireland will be hoping they can upset the two favourites to qualify. They’ll need to ensure they beat Georgia and Gibraltar in both games, and be on their best form against the favourites to sneak through to the Finals. 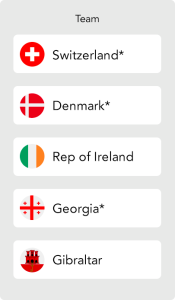 Who have Republic of Ireland got? The Irish face a really tricky task to make it through to the finals, but it’s not impossible. A lot of their hopes lie on how the others do rather than themselves. However, they’ll need to win the matches against the group’s relative minnows if they’re to have any hopes. Shane Long is a workhorse up front, and even though he doesn’t have the best goalscoring record for either club or country, he could fire his country to the Euros. Conor Hourihane has been in great form for Aston Villa, and if he carries that form into the qualifiers, the Irish will benefit greatly. World Cup runners-up, Croatia, are favourites to win Group E and secure their place at the Euros, but they’ll be chased all the way by Wales to take top spot. Ballon d’Or winner Luka Modric will be looking to lead Croatia, although he’ll still have a few star men to help, with Ivan Rakitic alongside him in centre midfield and Ivan Perisic out wide. Wales were the surprise package in the 2016 European Championships, and they’ll be hoping that new boss Ryan Giggs can lead them to another long run in the competition. Slovakia and Hungary could prove to be tough, and picking up three points in both games against these two sides will leave them in a good spot. Gareth Bale may not be in favour at Real Madrid, but he’s still the leader for Wales and somehow manages to perform almost every time he dons the Welsh shirt. Aaron Ramsey will be looking to show his new club, Juventus, exactly what they’re getting in these qualifiers by firing his country to qualification. The Welsh side actually have a really good chance of making it to the finals, with only Croatia being favoured. If the Welsh can perform well against the Croats, then they could top the group. It’s a close one to call, but the Welsh have it in them to go all the way. Spain, Sweden and Norway will be battling it out for the top two spots in the group. Spain come in as favourites and have great pedigree in this competition despite poor results in the last couple of international tournaments. Sweden haven’t faded despite the retirement of their long-serving talisman Zlatan Ibrahimovic. They’ll be second favourites to come through the group just ahead of Norway, though both sides have a playoff spot to fall back on. Spain have an abundance of attacking talent in the form of Marco Asensio, Suso and Alvaro Morata to look out for. Norway will be the side that the top two will need to beat, and if they do, there’s no stopping them charging to the finals in 2020. Poland and Austria are the favourites to come through the group, but Slovenia have proved a tricky task in qualification games before for some of Europe’s elite. Robert Lewandowski is the main goal scoring threat for Poland and is one of the best strikers in world football. Marko Arnautovic holds the keys to the Austrian attack, so opposition sides will need to nullify the threat posed by these two if they’re to beat the front runners. Games between Poland, Austria and Slovenia will decide the qualification places. Macedonia could be happy to fall back on their guaranteed playoff spot. Realistically, World Cup winners France should walk this group containing some of Europe’s lowest-ranked sides. Iceland were a surprise package at Euro 2016, knocking out England, and on their day have a shock in them. It’ll be a battle between Iceland and Turkey to secure the runner up spot behind France. Gylfi Sigurdsson is crucial to the Icelandic chances of qualification, and he’s currently in good form for Everton. France have some of the world’s best footballers on their side. Look out for Paul Pogba’s creativity, Antoine Greizmann’s finishing, Kylian Mbappe’s pace and N’Golo Kante’s tenacity. 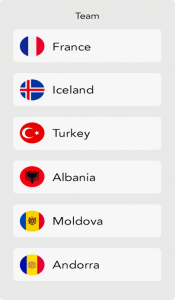 It’s the games against Albania, Moldova and Andorra that could decide this group. Avoid a shock in those and you’re in a good spot to qualify. In their home World Cup, Russia knocked out one of the tournament favourites in Spain and produced some standout performances. Unfortunately for them, one of the world-best sides is in their group, so Belgium are group favourites. Scotland and Russia will be battling it out for the second qualification spot, although Scotland have the benefit of a guaranteed playoff spot. Some of the world’s best attacking talent will play in this group, all coming from the Belgian side. Eden Hazard, Kevin De Bruyne and Romelu Lukaku tend to be sensational on the international stage, bettering their already-impressive domestic form. 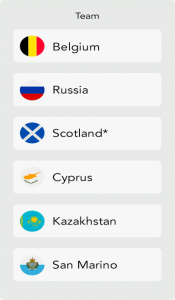 Russia and Scotland will need to win games against Cyprus, Kazakhstan and San Marino to boost their chances for qualification, while the clash between the two will be crucial to deciding who goes through with Belgium. Second spot is up for grabs, and it’ll be a tough battle between the Scots and the Russians to secure their slot at the finals. Young striker Oliver McBurnie is having an outstanding season in the Championship for Swansea, and he’ll be key to firing the Scots towards the European Championships. Oliver Burke has been highly rated for a number of years, but he’s found a place he loves to play at Celtic, so his form is peaking. Ryan Fraser and Stuart Armstrong have been shining lights in their respective club sides. With a playoff spot secured anyway, they’ll be among those battling to qualify, and they’ll have two bites at the cherry should they fail to secure automatic qualification. Italy will be resounding favourites to get through this qualification group, with only the Bosnia & Herzegovina tie a potential banana skin on paper. Roberto Mancini has reinvigorated the Italians and they’re looking like their old selves again, so should breeze through the group with ease. Lorenzo Insigne, Stephan El Shaarawy and Federico Bernadeschi are all danger men up top for the Italians and have come of age recently. Bosnia and Finland will battle it out for the second qualification spot. Edin Dzeko hasn’t been in great form this season and that could hamper the Bosnia’s chances, whereas Finland have a man in form up front in Teemu Pukki. The Bosnia v Finland clashes could be crucial in deciding the outcome of this group, though they both have the luxury of a playoff spot to fall back on. England and Scotland already boast playoff spots should they fail to qualify automatically. 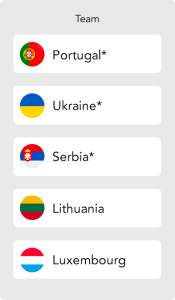 Alongside those two, Euro 2016 champions Portugal, Ukraine, Serbia, Netherlands, Sweden, Switzerland and Denmark hold playoff spots which could be up for grabs if they qualify automatically as expected. 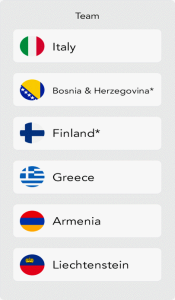 Smaller nations such as Kosovo, Belarus, Georgia, Norway, Macedonia, Bosnia & Herzegovina and Finland also hold a spot. The final four places in the playoffs will then be contested by the 16 group winners of the UEFA Nations League in the European Qualifiers Play-Offs in March 2020. If a group winner has already qualified for the European Championships, their spot in the playoffs will go to the next best ranked team in the Nations League groups. If a league doesn’t have four teams to compete in the playoffs, the next highest ranked team from the next league will slot in. Once groups have been determined, they’ll all have a play-off route to the final, featuring two single-leg semi-finals, and a single leg final. The winner of each path will then book their ticket to UEFA Euro 2020.